It feels like only yesterday the phenomenal local designer Laduma Ngxokolo was talking to Simba in his hometown about his heritage and journey into the fashion industry. Designer Laduma Ngxokolo has outdone himself once again. He completely took the fashion industry by storm with his Autumn / Winter collection in March this year and now he has taken his Maxhosa-inspired knitwear attire to the next level. His new range is astonishing and he has managed to maintain a signature so unique, his line is instantly recognizable. He has adapted his graphic knitwear for summer by cropping items, putting the print on different fabrics and designing wraparound items that would easily fit anyone. Fashion insiders are already calling him Africa's next biggest fashion export and we are not surprised as his items, with its roots in Xhosa heritage, is globally appealing. The fashion tip inspired by his range is to be fearless. Be bold in fashion choices. Take inspiration from all round you, your history and heritage and reinterpret it to suit your seasonal need. Another great piece of advice is to invest in a Maxhosa by Laduma item now, as this designer is truly one to invest in. 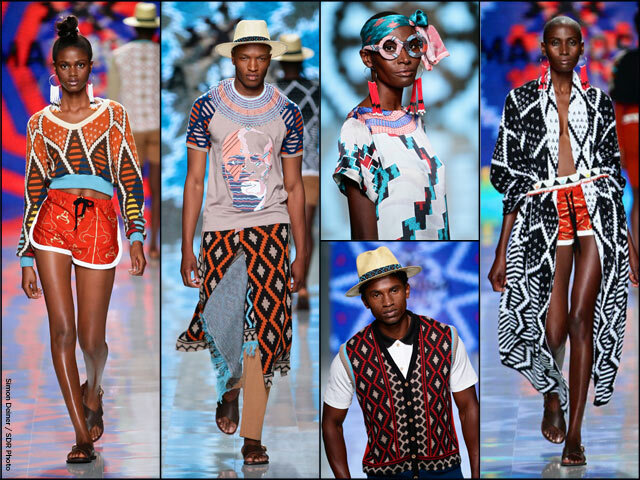 See his Maxhosa by Laduma's full Spring Summer 2015 range on SDR.